Today is the first day of Advent. Many Christians celebrate Advent, the time before Christmas. But what is it? How did it start? 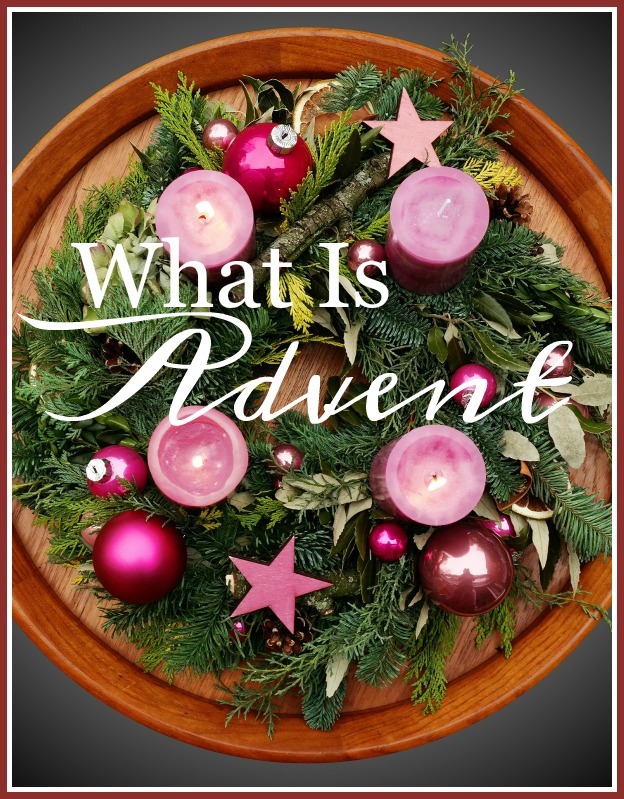 What does it symbolize and what does Advent mean for us today? Let’s look at this four week period before Christmas and learn the true meaning of Advent. The word ADVENT comes from the Latin word ADVENTUS meaning “the coming”. Advent begins on the Sunday closest to November 30th, the feast day of St Andrew the Apostle. Advent continues for four consecutive Sundays before Christmas. The starting and ending date of advent changes from year to year. Advent was probably started in the fourth century and was a time when Christians readied themselves for baptism. In the middle ages Advent began on November 11, the feast day of Saint Martin and would continue till Christmas Day . It was a time of fasting and prayer with a concentration of the second coming of our Lord, Jesus. In the last fifty years the emphasis has been on the Nativity of Jesus. It is a time of anticipation and spiritual readiness for Christmas day! The primary symbol of Advent is the Advent wreath. Ancient northern Europeans would light candles on a circle of greens in the dead of dark winter to symbolize ongoing life. The lit candles were a reminder of spring and the coming of lighter days ahead. By the 16th century Christians had adopted this wreath and used it as a symbol much as we do today. There are four candles on the advent wreath, three purple and one pink. The purple candles, that are lit on weeks one, two and four, symbolize hope, peace and love. The pink candle, lit on week three, symbolizes joy. 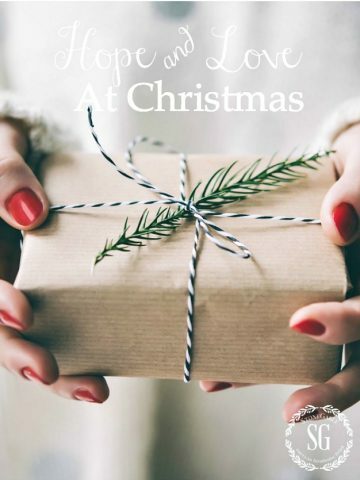 Each week as Christians prepare for the coming of Christmas they ponder on and pray for hope, peace, joy and love! There are many modern adaptations of the Advent wreath, but they primarily symbolize the same thing. Sometimes a large candle is lit in the center of the wreath to symbolize the birth of Christ, the Light of the world! Here at StoneGable, we practice lighting the Advent wreath and using it as a symbol of the true meaning of Christmas. But what does Advent mean to us today… and how does it help us draw closer to God and give him glory? Advent itself is a time of “readiness”. It’s a time to reflect and prepare our hearts for Christmas Day. The day we celebrate the fulfillment of many prophesies about the Christ. AND THE GOVERNMENTS WILL REST UPON HIS SHOULDERS. THEREFORE, THE LORD HIMSELF WILL GIVE YOU A SIGN; BEHOLD A VIRGIN WILL BE WITH CHILD AND BEAR A SON AND HE WILL BE CALLED IMMANUEL (WHICH MEANS “GOD WITH US”). Isaiah 7:14 and Matthew 1 22-23. There are many more fulfilled prophesies about the birth of Jesus, these are just a few. But as we reflect and prepare for celebrating the first coming of Jesus, Advent is also a time to also prepare for Jesus’ second and imminent coming! The bible is full of prophecies of Jesus’ second “advent” or coming to planet earth! Jesus’ purpose for first coming, what we celebrate at Christmas, was to save the lost. Jesus came to save you and to save me because we were lost in our sins and therefore, dead to a relationship with God. Jesus’ second coming will be to judge the whole world and to rule it forever! We who are saved by Jesus’ first coming will be safe from His judgement. During the Christmas season, the true meaning of Christmas and Advent can get buried in all our preparations… of our homes and gifts and food and gatherings. Let’s not forget the most important preparation… that of our hearts! Let’s use this Advent to reflect and remember Jesus’ first coming as we celebrate Christmas and prepare ourselves for Jesus’ second coming as King Of Kings! You can go on line to find great Advent devotionals to help you prepare your heart during this holy time of the year! You have a beautiful Advent wreath, Yvonne. I love the colors you have used. Have a blessed Christmas! I love you posts, especially those that draw me near to God. Thank you for your inspirational Sunday posts, Yvonne. I learn something each week. I have not seen one ariund in many years now. Thanks for the reminder of its symbolism. What a beautiful post! I love that you share ways to beautify our homes and also our hearts. Thank you for your detailed history and explanation of Advent! I didn’t grow up celebrating Advent but as an adult have come to love this part of the holiday more than the rest. I’ve enjoyed Bonhoeffer’s ‘God is in the Manger’ and Wangerin’s ‘Preparing for Jesus’ the last several years but was ready for something new. I just ordered ‘From Heaven’ by Tozer this morning (a little late!) and am looking forward to digging into that this Advent season! Yvonne, you are such a blessing to us with your posts! I always look forward to reading them! You are a wonderful teacher and always have such great devotionals. Bless you, my friend, with a wonderful week! Loved this ! Where do you get your devotionals for Advent from? I enjoyed reading your explanation of what Advent is as well as the previous comments posted. Your commentary has sparked a number of interesting replies. Gods blessings to you and your family Yvonne. The advent wreath is a simple and lovely way to focus on the Savior each Sunday.We are going to start this tradition as it was introduced to us by some German friends who invited us to their home for Second Advent. I am a member of the Church of Jesus Christ of Latter-day Saints, (often called “Mormons” which does not really express our focus on Jesus Christ as the cornerstone of our religion). This year, world-wide, our members are encouraged to do a simple kind act a day, as a gift to Christ. It does not really include the many ways we normally serve our families and others, but is an effort to choose to do something, however simple, and be mindful that it is to show your love for Christ by serving and encouraging others. For me Christmas music is so beautiful, if carefully chosen it can set a happy but calm spirit in your home for the season. We are blessed with music from hundreds of years past to help us remember Christ as the focus of our Christmas. It is a joyful time. Thank you for sharing the meaning of Advent. Your blog is a blessing! It is so easy to get rushed through the Christmas season that we sometimes forget what the true meaning of Christmas is. God Bless you and your family! Thank you for your explanation of Advent. Happy Thanksgiving, Merry Christmas and thanks for the thoughts today! Thank you for the Advent explanation! Thank you for the explanation. I never really knew the full meaning! I love the advent celebration–and yes, we usually have an advent wreath making workshop in our church as well. I think that celebrating advent, and the lighting of the next candle on each successive Sunday, helps us stay focused on the true holiness of the Christmas season. May you and your family have a beautiful advent, Yvonne. Thanks, as always, for your inspiration. You’ve become an important part of my life. Great Gospel sharing, Yvonne! Thank you! Our church had our first week of Advent today, as we will light a white candle on Christmas Sunday. Thankful that it all came together, as our supplies were a bit difficult to find this year in our supply room.? Thankful that He was glorified, even through the bit of stress! We have our advent wreath on our dining table. Thanks for adding the explanation of Advent. Wonderful job! Thanks! Thank you for the Advent explanation and we must remember what this season is all about. Beautiful explanation of Advent and the continuity of the OT and NT. Several Protestant churches use blue candles instead of purple, representing more the theme of hope rather than the penitential purple. 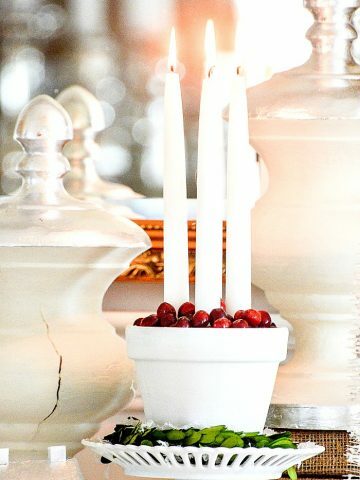 Often candle one is also called the prophecy candle (hope), the second the Bethlehem candle ( preparation), the third the shepherd candle (joy), the fourth the angel candle (love) and a 5th white Christ candle in the middle. In the United Kingdom the candles are often red. Thank you for oyur post on the advent. It was very interesting. Thank you for a wonderful post. You know our Lord was represented in the Bible as a lamb….did you ever think that lambs are born in the Spring of the year ? Our Lord was too if you read the scriptures, we celebrate it in Dec. but He was born in the Spring. Just a blessing to know that He came into this world just to save us , heal us and soon take us to our Heavenly home .Looking for that day. Thank you! We do not celebrate Advent at our church but have an awareness of preparation of our hearts at Christmas as we celebrate Christ’s birth. I truly enjoyed your blog. 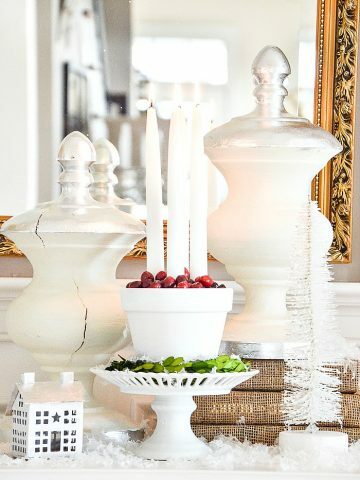 An Advent wreath will be a new addition to our dining room table. Thank you for the explanation of Advent. Very enjoyable! What a lovely reminder, thank you! of Advent.Also love the meaning behind the wreath. Praise God from whom all blessings flow… Our church has young families (including their children) to light a candle and read Scripture. Advent is a special time to remember the wonders of our Lord. Thank you for this informative post on Advent, Yvonne. Advent is a time to rejoice in the hope the Christ child brings! Thank you for explaining Advent! Thank you for posting about what Christmas really is! It is about our Lord & Savior Jesus Christ! Thank you Yvonne for your blog, which I find so inspiring each week. Thank you for sharing the meaning of Advent with your readers. The true celebration is the birth of our Lord Jesus Christ. I truly loved all the history you shared Yvonne. I too celebrate Advent. My blog post today was on hope. My goal this week is to seek out those in need of hope and be the light. Sometimes all it takes is a kind smile to a harried clerk. It is my hope that little kindnesses change the world. Love your advent wreath display. A beautiful hopeful time of the season. Thank-you, Yvonne! I am ashamed to say that I did not remember the meaning of Advent. I always say, your second calling is in the pulpit!!! Beautiful, Yvonne! I think too much of the meaning of Christmas is being squeezed out! I refuse to say “Happy Holidays” I say to one and all “Merry Christmas” and my Christmas cards have a religious meaning. I want God back in our lives. Have a wonderful Sunday! I’m with you Marisa. 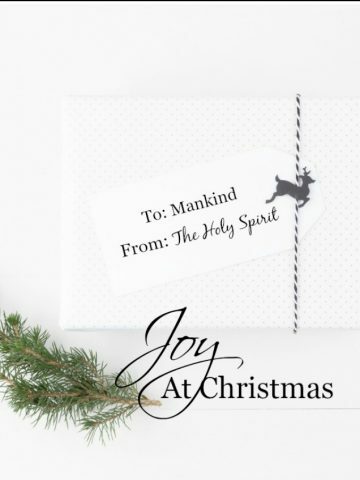 I have sent a religious card (the meaning of Christmas) for the last 52 years. I love the saying “HE is the reason for the season”. Wonderful explanation. My husband is a Southern Baptist pastor and we have had an Advent Wreath at home and at our church for many years in the past. It is such a beautiful way to teach about Jesus. Thank you for adding those teachings to your blog. Merry Christmas! Your article has reminded me how beautiful Advent is. It’s been a very long time since we celebrated it with our children. I think it is probably time to teach the grandchildren about Advent. Thank You very much. Will share this information with my 4th/5th Sunday School class. Amen. Thank you for sending your son, Father God. Love the reminder of what the true meaning of Christmas is! Thank you for explaining Advent. Hope, peace, love and joy. I pray for all of these things in our world today. May this Advent Season be an inspiration for all. Blessings to you on this beautiful Sunday. We are in Germany as I type this. Of course advent wreaths (real greenery) are everywhere. Though I am a believer and our Christmas at our house centers around the birth of our Lord, I’ve never had an advent wreath. That will change. We have filled in for the Internal Baptist Church here in Munich (21 different nations represented) for the past 6 weeks while there pastor is stateside.. IBC Munich meets in the building of an Evengelical German church. Just this past week my husband and our Outreach Leader joined the German church and some of their people as they ministered to some of the refugees here in Munich. The pastor of the German church used the Advent to fully explain the gospel. Enjoyed your post. Blessings to you and yours! Wow, thank you for the insight into what’s going on in Germany. If one refugee is converted to beleive Jesus is our Lord you have earned your place in heaven! Keep up the good work. June, we can’t earn our place in heaven! We’re saved when we realize we have no righteousness of our own (and can’t do anything to get it, therefore needing a savior) and repent and turn away from our sin and trust that Jesus paid the price for us when he died and rose again. When we do that our sin transfers to Jesus and His righteousness is imputed to us and we are born again of the spirit. Then and only then can we stand righteous and justified in front of our Holy God! Have a very merry Christmas and God bless you! Thank you so much. Your piece is beautiful. Great explanation. I have enjoyed reading your inspirational posts along with the decor ones. Thank you. In the Orthodox Christian Church, we begin Advent on November 15, for a full 40 days, the same as Lent. Some churches and homes are decorated with greens, a manger or nativity and other symbols of the upcoming Feast Day! To quote Fr. Henry Patrick Reardon, “In the Eastern Orthodox Church, the corresponding penitential season of preparation for Christmas always begins on November 15, the day after the Feast of the Apostle Philip. For this reason it is popularly known as St. Philip’s Fast. A simple count of the days between November 15 and December 25 shows that this special period lasts exactly 40 days, the same as Lent. First, in the West the First Sunday of Advent is treated as the beginning of the liturgical year. (In the East, the liturgical year does not begin with Advent but on September 1, which bears the traditional title, “Crown of the Year.” Its historical relationship to the Jewish feast of Rosh Hashanah is obvious.) Second, during the twentieth century there arose the lovely custom of the Advent wreath, both in church buildings and in homes. This wreath lies horizontal and is adorned with four candles. The latter, symbolic of the four millennia covered in Old Testament history, are lit, one at a time, on each Saturday evening preceding the four Sundays of Advent, by way of marking the stages in the season until Christmas. This modern practice has already started in some Orthodox Christian homes, where the longer season requires six candles on the Advent wreath.